Casperkill Campus, Faith Assembly of God, Poughkeepsie, NY – If you say you have love but you don’t have the Truth with in you; then you have neither Love or God. A leader from Faith Assembly of God, Poughkeepsie, NY has stepped forward to counter this blog. And this is Part two of a two part answer to his challenge. This post is a continuation to our response to John Morabito, a member of Pastor Edward A Jones’ Inner Ciricle. Part One has a full prologue where we tell you why we responded to John Morabito’s 220 word ad hominem attack and why we responded at all due to the nature of what was written. In its entirety not to include the Prologue to our response is in 11 sections back to John Morabito which was sent in advance to John Morabito (and we assume Pastor Edward A Jones)before posting this on our blog. John Ms Attack Point Number 3 – John played the “Forgiveness Card”. We call this the “Forgiveness Card and Cheap Grace” This is a theological discussion on how and why we as Christians must have a “Penitent Faith” in Christ. John Ms Attack Point Number 5 – We examine John’s definition of “Petty” and how it is used to demean victims and their families to protect unrepentant criminal activity. Minimalize the sin by Minimalizing the Pain of the victims. Minimalization is a classic cult / narcissist technique. This was a very hard section to write and a very hard section for my loved ones to read and relive. In this post, Part 2 of our Response to John Morabito will start where we left off at. We will start off at “John M’s Attack Point 6” and conclude with our “Conclusion and Final Remarks” as in the original response that John has received (as well as we assume Pastor Edward A. Jones also received. John Ms Attack Point Number 6 – We examine his use of “Move On” and committing “Blasphemy” using the Lord’s name in conjunction with it. John Ms Attack Point Number 7 – John expressed doubt I was “called” to write this blog and I gently remind him that scripture calls us all that hold the office of “High Priest of all believers” (which is all) to do so and how. Conclusion and Final Remarks of our response – not really a summary. We reemphasize a point or two. It also includes an Administrative Section which redirects any direct response to Pastor Jones. As we did in previous posts we will post any significant additions to the original letter in Bold Red and post any later additional comments we may have in Bold Blue. At the end of the response we sent to John Morabito we will then conclude with “A Brief Conclusion and Commentary of this two part series”. If you have not read Part One of Our Response to a Faith Assembly of God Leader in Poughkeepsie: John Morabito, then we suggest you read it (or re-read it) before reading Part Two. And we realize it is a long post, so if you don’t want to go through it all we then suggest the second best thing is to just read the Prologue before we start the letter on Part One and The Section we call John M’s Attack Point 3 we call the “Forgiveness Card and Cheap Grace”. Note Aside: John M’s Attack Point 3 section, what we call the “Forgiveness Card and Cheap Grace” is probably the key section back in our response back to John Morabito. It just may illuminate the pathology of the corruption of selected leadership at Faith Assembly of God and certain member’s criminal activities. You will find Part Two quite a bit shorter then Part One. So if you read through Part One, Part Two will be a breeze for you. Before we start with the remainder of our response back to John Morabito, we would like to give you two quotes to think about that we hope will set the tone for the rest of our response. These quotes can also be found in the last section we published in Part One under John’s Attack Point 5. The second quote is from the Holy Scripture. Jesus is speaking. This is more than a story about someone that was crippled by the criminals that run a ministry. It is more than a church leadership seeking to protect those criminals. It is more than a story of the people who had to bare the ungodly burden placed upon them by leaders willing to subvert the Holy Scripture, their own stated doctrine, and their legal requirements within their Constitution and ByLaws. It is a story about “expediency over righteousness” It is more about what Yeshua warned His children would happen. It is a story about Cheap Grace and the high cost we will eventually pay for it. It is a story that is an example for the world and the “true” Church what is happening within Biblical Christianity aka the visible church. John M’s Attack Point Number 6 – Saying just to “Move On” and at the same time engaged blaspheming the Lord’s name. Let me divide this in two parts. We will briefly deal the more serious part, your blasphemy, second. On the “Move On” comment we have dealt with several reasons that should have been apparent to you why we will keep our blog up to include the threats to do harm. I’m not going to rehash. Frankly John, you don’t have the personal integrity to influence us to the contrary. This “Move On” comment was disingenuous at best. Your concerns are not coming from a pure motive. It is to stop the truth that the Bible says should be dealt with. You are more concerned “maintaining appearances” than the truth. You have no real goal of what God says should be your goal. Don’t ever tell someone to “MOVE ON” Christian if you are not willing to show real substantial compassion and learn his or her pain while walking with them. Definitely never tell someone to move on while they are going through it. As you see I will live through a life time. And John, NEVER EVER tell someone to “MOVE ON” when you have displayed contempt for the Biblical Process of “Biblically Moving On” of repentance (godly sorrow, confession to the harmed, correcting the sin… you know repentance) and healing. Especially do not tell someone to “Move On” when you go to such extent as documented in your letter to accuse falsely using proven devious methods to defend the sin that harmed so many people. That is called corruption brother. You only had those in mind. You certainly didn’t care about what Yahweh had to say about it. You are truly a purveyor of Cheap Grace. You certainly wouldn’t defend the Biblical mandate of scripture and use your influence that way. Wh is your Daddy? Do you follow King Edward A Jones or King Jesus? And then you use the Lord name’s in vain. That is Blasphemy. NEVER use His name to promote mans agenda, attack the innocent and justify sin. You should be ashamed. You show no Fear of the God who created you. Do you really believe that Yeshua wants His name attached to your false accusations and ad hominem attacks? This is no simple Blasphemy and all is sin. You are no pagan teenager texting OMG on your cell phone. (And yes that is sin to a Holy God.) You are a self proclaimed leader in the Church. Do you know what you told the “world” about what it means to be a Christian Leader? What have you communicated to the youth in the church and the new believers? You cheapened the Lord’s name to promote your false accusations and ad hominem attacks. And make no mistake about it, you wanted that post to go through without censor. That makes this sin a public sin. Do not go up on that platform Brother without a public confession to that “world” of your repentance. Did you not read and learn from my public admonishment of Brother Martone? Did you not take counsel of the Holy Spirit before writing that? If you believe that “Jesus” led you to falsely accuse someone in order to cover up the sins of leadership rather than comfort the battered sheep; then sir I would say you follow a different Jesus. Repent Brother before your heart is hardened. John M’s Attack Point Number 7 – You expressed doubt that the Lord called me to do what I did. I am not going to use your sarcastic words and imputed “Straw Man” lie by innuendo to take us off topic here John. I have “dignified” enough of your points by quoting them. You have built enough “Straw Men” in your letter to staff a Scare Crow Convention. John, guess what. The Lord did tell me. No, not in an audible voice or signs and wonders like a talking mule; He tells us all. It is called the Bible. Study and show yourself approved. Some of the scriptures have already been noted in this blog. If you read your Bible brother, Jesus states by far the signs for the end of the Age of Grace, will be the falling away within the Church with Heresy. He mentions it 4 times in Matthew 24 more than any other sign of the end of the Age (AKA: the Olivet Discourse). Yeshua and His apostles have warned the church. And He tells us to expose both the moral and doctrinal heretical leaders in the hope of “repentance” and to warn the true church in the visible church. And let me remind you again, this was attempted to be addressed privately and or semi-privately as doctrine suggests. I’m sorry, you don’t like that Word, but it is Biblical Doctrine. Isn’t it John? You see John, the greatest work for apologetics today is not with cults like the Mormons or the Jehovah Witnesses. It is within the church itself. Again Christ told us. Doctrinal failure always ends up as Moral failure. Each age has its Heresies to deal with and we are dealing with an expansion of the heresies like no other time in church history. And for the local church to ignore, make excuses, and even participate in them without dealing with them or examining themselves like individuals in the Lord should; it will bring destruction to the Body of Christ. If you say that this can’t happen in “my” church or “my” pastor you are forgetting the simple fact that we are all “fallen” from grace and it is within “all” of us to sin. It is called the Doctrine of Depravity. And John it is in our church. Not to talk about it and deal with it means you have to ignore Yeshua himself as he told you to look for it. You have to ignore significant writings of the apostles. And if you are a Leader/Teacher in the Church and don’t teach it, it means probably you don’t want the church to ponder on it. For what reason you ask? I think the answer is obvious here. The whole counsel of the word is to be taught. Every generation has it’s heresies to deal with. If they don’t, the next generation has the greater and more difficult task of addressing them when the wolves are entrenched. Today the American (Western Church) Church is the greatest exporter of Heresy to the church worldwide. “Being quiet” about it brought us to the point where we no longer can defend our testimony because we are too busy dealing with the dishonor these heresies bring to the church and world sees it. For example, what does it say John when the church has people in leadership that support the NAR (New Apostolic Reformation) with all it’s parlor tricks and rank heresy like Dominionism that was declared as such by the Assembly of God? They are lunatics. Even the world sees it. Yet we have people on the Board that actively support it if not support it through ministries who are headed by those false teachers. Again what does Paul say about these Heretics. They are not to be leaders. If they persist we are to separate from them or separate them from the flock. Paul says let them be accursed if they won’t repent. That is Biblical truth John. How can the church gently correct a sheep, when they allow it among leadership or people the leadership actively supports? The Druckerites and the lunatics in the NAR who are proponents of Cheap Grace and Doctrinal apostasy are just the tip of the iceberg. As mentioned not just by me, but by orthodox scholars, apologists, theologians, there is always a bridge between moral declines in the church with doctrinal heresy. To name a few is Jacob Prasch (Pentecostal), Chris Rosebrough (Confessional Lutheran) Dr. James White (Reformed Baptist), and David Wilkerson (AoG). And they are not silent. (“were” in the context of David Wilerson.) They mention names and the sin. They encourage otherwise than to be silent. Jacob Prasch says the only two things to do that is “honorable” when we witnessed as I witnessed is to “Stand up and Leave” and/or “Stand up and Fight”. Those are the two Biblical Options I had. Those who stay seated in silence do not honor Yahweh. Those who defend this behavior who are self promoting leaders outright disgrace Christ. That especially applies to those leaders that stoop down and use the argumentation in your attack letter that represents willful deceit to silence righteous dissent. The options you choose is not in the Bible, but is noted as the signs of a good church turning into a cult. Why don’t you re-review the Dr. Jerry Kaifetz videos attached to “Part two: Answering Inquiries” for more on this? It is the actions of a man who is a purveyor of “Cheap Grace”. Your comment represents three big problems here at Faith Assembly of God. The First is that to make such a comment illuminates the fact that you and other leaders have not shown you know the Bible and your Theology and Doctrine and/or you prefer to ignore God’s Word. This is a little confession John; when I first became a member of Faith Assembly of God I was jealous of those who I thought must have all this Biblical knowledge because they were either born in a Biblical Church and or had all this “food” of Christ that Peter was told to give the sheep on a regular basis. I was so hungry. But as I walked I began to find out that things were not as they appeared to be. I found that people really didn’t have the hunger for “Truth” that sent me down to my knees. I found out how superficial our love for the Brethren was. Actually the words of Ed Jones inspired me to go further when in membership class he told us doctrine was important. So I found out what that was and why it was important. Then I made the connection of Truth of Scripture to Theology. You see John, I found out the hard way that many in leadership were there because they are promoters of men and not lovers of Truth. They repeat what others say about the Word of God, but they don’t know the “Word” in context. And it doesn’t matter to them that they don’t. The fact that you don’t seem to be aware that unrepentant sin is not something we don’t address, especially in the context of leaders and “would be” leaders is folly. Remember Yeshua attacked Pharisaical sin in public thirteen times. In the Epistles we are told to fight it at least seventeen to nineteen times. It is part of the ministry of “the Priesthood of the Believer”. And if you don’t believe in the authority given to the individual “Believer”, how can a leader expect Yahweh to honor that leader who doesn’t? The Second point of my answer to your comment reflects that you don’t take serious the damage of Heretical behavior, both doctrinal and moral has on the body of Christ and the witness to the world. This could be related to the first. Like I said, we are living in a time where we are fools not to take Yeshua’s warnings about the end of the Age of Grace. He tells of the corruption of the church and that is where we see the bulk of these signs. I could list more than I have. I talk about it in the hope that my brethren will actually care about what Jesus says we should and study for themselves what I have encountered. And as I also stated it is this generation that is paying for the Heretical Doctrine that the older generation refused to deal with. Like it or not, we are losing the message of the Gospel as these wolves come into the church through their followers unchecked and allowed to spread their nonsense and garner support for those who teach a different Christ or Gospel. It isn’t just the NAR (which is a AoG declared heresy brother – “Latter Rain Movement”) Or the dumbing down Bible twisting Druckerites or the Word Faith movement who caters to the narcissist itching ear types. It goes on in a slew of ministries that out right steal the sheep’s money on false promises like the Benny Hinn and Kenny Copland who prey on the poor among us because they are not taught as scripture says that these men and woman are frauds. Second Timothy Chapter Three comes to mind. There is never been a time since the reformation we have seen this much “Gospel Destroying” Heresy allowed into the church. The world sees this destruction and they report it. We need to thank them and show the world “the church” has the righteousness within to deal with this or we have to compromise and become an “organization” of the world. John, when people see what I wrote outside of Faith Assembly of God who are in the world; at least they don’t see a characterization of a “Christian” that will follow a leader blindly, ignore his or her own sacred scriptures and look away from sin that they wouldn’t look away from. But they look at you John and see a leader of the church who doesn’t have compassion for the hurt and as a declared “Christian Leader that is willing to point your finger like a Pharisee to cover-up for the sins of other leaders. They see a leader that doesn’t have the love for their scriptures and their legal documents and thinks the Creator of the Universe is less than what we say about Him. And that leads into my final and third point to your sarcastic attack point. This again would not be necessary to even discuss if leadership would call these heretical movements as they are: Rank Heresy. It happens when you don’t teach the whole counsel of the Word of God. We should be warning the saints, but it seems we even protect these wolves outside the local church. First name the heretics who are pilfering the souls of the Saints and name these movements. And after you do that, tell the leaders who won’t separate themselves from these wolves, that they can no longer be leaders. Once you have leaders that have confessed and cleansed these Heresies from their lives, you have leaders that can lovingly correct the saints with Orthodox Doctrine why they have to let go of these sins. This is just a Biblical suggestion John. And John, if you say there are none who embrace these heretical doctrines. You either knowingly lie or want me to publish the names. Like I said before John, the American Evangelical Church is now the prime exporter of Heresy for the Biblical Church in the world. We have fooled ourselves in making light of the Gospel where we no longer have a message. We allow heresy to seep in and it becomes an imbedded decease where we no longer have either a relation with the Savior and has a working culture that looks like the “world”. To please the world we have become like the world. We can no longer hold a moral position without the world laughing. They see us creating little popes on earth in Mega Churches while others act like a circus act. How many of these Mega Churches with their little popes worldwide have drawn scandal to themselves and shame to the church? We have seen these exports end up in churches in the third world promoting greed and making the local tribal religions look more Godly. All while feeding peoples darkest desires for lies about wealth and formula prayers. They don’t learn the Gospel of Jesus Christ. They learn Prosperity Doctrine of Joel Osteen and T. D. Jakes. We are playing God when we turn a blind eye to this and don’t warn others not to preserve a false peace. Preserving a false peace in this manner is just an unbiblical excuse. We are to warn the bretheren. Titus says it is the people who hold the offices in Christ’s Church who are to do it, but in all too many circumstances they are the ones who are supporting these wolves who help the forces of darkness in supporting them. Do we speak the truth to the Brethren? If we don’t, we really don’t love them. When I write about these things, it is my hope that it will cause some stir enough that the reader will research on what I say and learn. My hope is that if the brethren love Yeshua enough to study to show themselves approved when they have to apply scripture to research these vipers. It doesn’t bother me that Brothers and Sisters motives are just to try to prove me wrong. I am praying that truth will win out. And I don’t worry about what the outside thinks, because it may spark a curiosity to find out what this Jesus is about and just may find the Gospel when they research these wolves because they have to learn the Gospel to know what I am writing about. I don’t include these names of heretical movements like the NAR (New Apostolic Reformation) because I like to fill in blog space, I put them in because they are a contributing factor to the Pharisaical sin that is part of the culture at Faith Assembly of God, Poughkeepsie, NY. And I do find it hard to believe that Ed Jones doesn’t know our fellowship, the Assemblies of God, considered this Heresy in the form of the Latter Rain Movement was declared as such in 1949 and almost destroyed our Canadian Brethren’s fellowships. So why has EJ done nothing since I wrote the post back July 2014. It was a gentle hint for him to clean up his act even though it was about Ramsey-Dixon and her continuous heretical behavior to check his own house. Hint – There are board members involved in this heretical movement. John, study to show yourself approved. The local church is in trouble and so is Faith Assembly of God of Poughkeepsie, NY. I have mentioned a few apologists from a diversified group of respected Biblical Christian Teachers Rosebrough, Prasch, and White from all over what is left from within Evangelical Biblical Christianity. Why don’t you check them out? Oh yeah, there are others too. So John in conclusion of Attack Point 7, yep, the Lord did give me this ministry to work. And as the Lord knows I didn’t want it. He gives us all of us “this” ministry at one time or another in our walk whether we recognize it or not. Your sarcasm is in short is an admission that you failed in this area. Remember the cause of Division in a church comes from leadership, not us sheep. It is bad doctrine that leads to disunity. It isn’t a sheep pointing it out. When sheep get blamed for Biblical disunity, it is a sign of a cult. But John, I have one question for you. Did the Lord give you a ministry to cover-up sin using known deceitful argumentation, false accusations and blaspheming His Holy Name? John, you don’t have to answer that. John M’s Attack Point Number 8 – You stated in words to affect; that questioned how this (blog) would be a help to anyone, you fail to see the good and it’s not positive at all. Well John, it is a question at first glance that I can honestly say it isn’t for you or me to see the results of obedience of God. Surely when Jeremiah and the other prophets were in obedience to God, they saw nothing but heart ache. I have paid people’s rent, gave to folk my last $20 and never saw results. Talked about Jesus and gave Bibles to strangers that I will never see again. Prayed for people as the spirit led and never see results. Prayed for my enemies. Guess what, I may never see results here in this world. It doesn’t bother me all that much. I am not God and I trust in Him on what He does and says. He is sovereign, neither you or I am. But the fact is, it has had a positive effect and helped others for the better. It also brought me closer to Yeshua with understanding that I would have never had. I write about it, but not nearly enough. Maybe I should. I have also outlined in the beginning of this response a major reason that “helps” my family in limiting the hand of a dangerous criminal team of Cocurullo and Ramsey-Dixon that seems to have no boundaries. Let me suggest some possibilities and why people who are experts in this area tell you to do what I did. It tells saints that are going through what my family and I did (and is) that they are not crazy. It encourages them. And it gives those abuse sheep information how to spot and with resources. It warns other saints of the signs of an unbiblical leadership and the abuse to watch out for. Even if they read this now and have a defensive mindset or “Bunker Mentality” or “not in my church” attitude, they may take pause and on a later date see another sheep go through the same thing and react as a Brother or a Sister and come alongside and do the right thing. It may actually cause someone to research and refine their doctrine closer to Yahweh’s as the Bible suggest. It is a possibility that when a certain team member of the aforementioned Cocurullo/Ramsey-Dixon returns to her vomit, it just may protect another victim with the knowledge it represents. This is a real practical one. It does what the Bible says and gives warning to others that may be inclined to act the same as the false leader/prophet or Teacher the Bible states. It simply may cause people to reexamine themselves and repent. What a novelty. Real Godly sorrow, repentance to those we harm, make restitution, correct the harm we have done and be reconciled to a Brother and a Sister and bask in the Grace of God being forgiven. Live a Penitent Faith in Jesus. But then again, none of that may happen. And maybe a sovereign God will do something else. But John I do understand your position. You see this with a mindset that you don’t expect change because in your heart of hearts the people involved can’t change or you see too much work in facing the truth and don’t want reform. If you are in a “Bunker Mentality” when you see people upset and you are seeing truth made public that has a possibility to make change, it is easier to sin some more then possibly come to the reality that change needs to happen to focus back on Jesus. Been there. Been in denial myself. Didn’t want to look in that mirror. Then I realized that I am that wretch of all wretches. That is when Yeshua can do the best work in us. When we realize that He changes us because we can’t. You see John, I pray for reform. I love my church enough to state what’s wrong. And when I say the church, I do not mean the organization. I mean the remnant that is in there. I also love the goats who have been deceived or haven’t come to a saving knowledge of Jesus. And yet that comes only by the grace of Yahweh who gathers His children that He has chosen. What this blog and our response to you represent is an unanswered STANDING INDICTMENT. This should be a good enough reason for any reasonable Christian Leader. Public pharisaical sin means public rebuke. It also means public confession that is not contrived as “part” and start of repentance (private confession, restitution, etc…) for any hope of reconciliation of the victims and the beginning of a restoration process if possible for any leader involved. That is the Biblical Mandate. Don’t like it John. I understand. But that is doctrine. The church’s unwritten “mystery” indictment against me, was first to disfellowship me via a Sadistic Gag Order by Pastrix Schreck, and finally with the Martone/Jones Formal Exile Letter is no such an indictment at all. It has no complainants and has no sin attached to it that warrants removal from fellowship. None. Nada. Zip. The Jones mystery indictment against me is a sheet a paper that trumps innuendo over substance signed by someone that will not account for the words he put on that paper and has no reason on it.. It is expedience over righteousness. 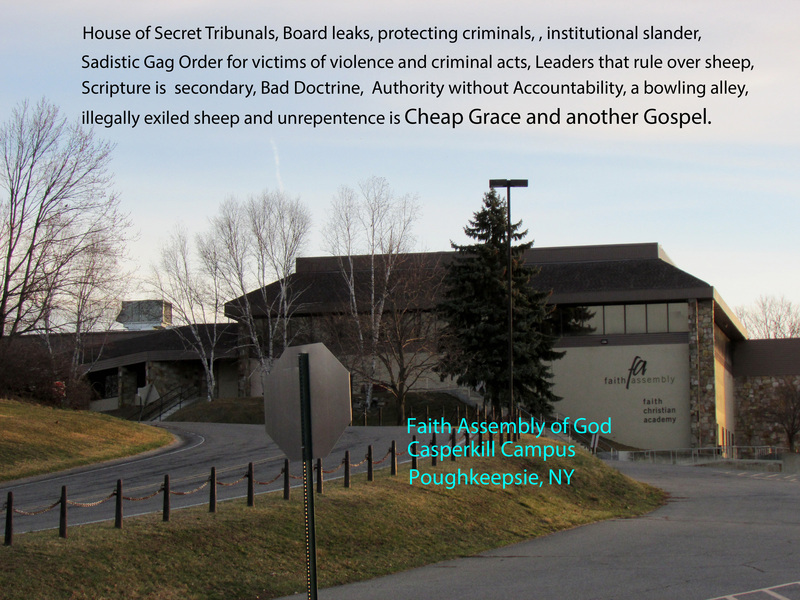 It is cheap grace presented cowardly by those who have no love for truth, God’s Word, and the Bylaws and Constitution of Faith Assembly of God in Poughkeepsie, NY; which tells the criteria how someone is removed from membership. It defiles the offices that are supposed represent Christ himself, by some people who no longer (or ever had) the qualifications of an “Overseer” as stated in the scriptures. And John, you inevitably showed that to be true because you stated nothing to the contrary. Nothing. Point of Fact; you address nothing to the contrary to our STANDING INDICTMENT. And sir if you could defend the illegal exile, then John you would have. If the level of debate has lowered itself within leadership to go after someone who was crippled, slandered, stalked extortion using the most vulnerable and then exiled to save face by using pure ad hominem attacks and false accusation; then sir the ability to reform within is not within the church organization to do it on it’s own. To overlook the protected class, culture of gossip/slander, “get even” mentality, moral cowardliness of leadership, secret tribunals as you have, should put one on notice. It is plain corruption. But you have demonstrated it with your letter that you and certain leaders are oblivious to the seriousness of what is going on and care more about appearances than the “sin” of the law. And John, that is one reason why this blog is here. If one remains silent. It will not change. And if it doesn’t change than people should be warned. I write for many reasons, the first it is as scripture dictates. The other reasons are secondary but important. And on that list is for reform for my church or if your heart(s) have grown hardened to expose and warn. To say nothing when you can; does several things to include say there is nothing worth fighting for. Not the innocent, not the unrepentant and his or her relationship with the Lord, and not God’s word. If one remains silent, it will happen again. That is the legacy of cheap grace. That offends a righteous God, but soothes the carnality of man. It is a reminder of the separation that would exist if we didn’t have a savior who died on that cross and was raised in the resurrection. There is no Love when the truth is hidden. We are to have a Penitent Faith in Christ. There is no glory for God when we are silent about the sins of the Pharisees. The wolves posing as shepherds give no mercy to the sheep.
. . . In such a Church the world finds a cheap covering for its sins; no contrition is required, still less any real desire to be delivered from sin. . . This STANDING INDICTMENT in the form of this blog needs to be answered. It is plain church corruption to ignore it and not answer it. Neither you nor Pastor Edward Jones can morally, ethically and/or Biblically defend the position not to answer it. Your attack proves that. What happened was and is evil for which a lot of people were affected negatively toward Christ, the Church in general and Faith Assembly of God specifically. Not because the truth was told, but because the truth was silenced. Where is the transparency that is supposed to happen for victims of violence? Why was the Biblical mandate of the church ignored? If for no other reason to show these people who were harmed that this is not of Jesus what happened to me and others. This is more than two violent reprobates who follow a different Gospel/Jesus; it is a lot more about how the leadership of a church who forgot (or maybe never knew) who loved them first and lost their fear of an Almighty God who has their future in His hands. The points you should be raising is what good is coming out of this by covering up the sin that should be exposed in according to scripture. It only produced more sin against the victims. That should be the point made by a man who follows Yeshua. But then we go back to cheap grace and the question that was asked at the end of our response to your Attack Point Number 3 “the Forgiveness Card and Cheap Grace”. And that really does take a Penitent Faith in Yeshua. Well John, I know you are disappointed because there is so much to talk about and we didn’t scratch the suface. I did cover the major points. And actually if you reread the whole blog anything you have thought I missed are in this letter or the rest of my blog in a form you don’t like. I don’t feel it necessary to repeat myself just to embarrass you. That is not what I am about. People who know me know I don’t provoke just for the sake of provocation. I don’t want to rehash any the points that I have made Brother. But let me once again make this point I started out with. A point that you have seem to miss and you shouldn’t have. My family is important to me. I will NOT yield to threats from the two reprobates who did my family evil and threatened to do more. And we regard them as dangerous especially when Cocurullo went as far as she did and sought to use the most vulnerable in my family to get to me after these two already harmed us and her personal threats would not stick. That is a person who knows no limits of evil. And again apparently has the blessing of her partner Ramsey-Dixon. Reread the beginning of the letter before you get the idea that you have something to say about it . My family matters. They are NOT a sacrifice at the modern alter of Baal within any church for cult like purposes. Understand that brother. I will do what is legal and Biblical to act as a cushion from the likes of two who harmed them, the ones who will help them. The foremost formal debater in apologetics today is a man called Dr. James White from Alpha and Omega Ministries in Pheonix Arizona. I really can’t think of anyone in the field that comes close to his integrity who does what he does. Men with integrity are attacked more than ever in Christendom today because truth is more a rapidly deteriorating commodity than even the world. And Dr. White is a target and has no lack of enemies. Dr. James White of Alpha and Omega Ministries recommends only giving into the opinions and criticism the weight they deserve. John, when “my board” and we knew from the beginning when we saw your submission that was one long ad hominem attack we made a decision that went against Dr. White’s advise in these matters. John, your response of this blog was to bring down the level of discussion lower than a political message board. Our response back was patient, direct and to the point. You did provide an example of the mindset of leadership at Faith Assembly of God in Poughkeepsie NY by the temperament of your attack with you pure attack on this blog using almost every cliché, false accusation and diversion tactic that was in your arsenal without touching on the critical arguments of deep seated moral corruption. And John, that saddens me. It was not just lacking substance. Your response was totally void of compassion of people whose lives that will be changed forever not by the criminal violent narcissist activities of two people who should not be in ministry, but by leaders who are playing church who sullied their office in Christ’s church. Not yours, Not mine… Yeshua’s Church! And that John is more than a slap in this cripple’s face, my family’s face and others who have suffered at the hand of corrupt church leadership. It is a slap in the face of Yeshua. Your submission was invaluable to us in that respect to use as an example as a leader of Faith Assembly of God. Like we said in the beginning, you have provided us with a treasure that folk is the business of studying Spiritual Abuse and Cults who study the tactics of this American phenomenon. With that said John, there was NO moral, ethical and/or Biblical cumpulsion to answer your continuous ad hominem attack which was written obvious dubious motives. I hope to you didn’t deceive yourself in believing it was. My feet was held to the fire. And as a cripple victim who was the target of evil, I was held like I was the criminals who went after people’s families. But then John, by not addressing the sin at hand directly, you have proved there is no defense for what was done to us. And John you are a high profile leader who has acted as a spokesman in the walls and out for the church leadership. You should have higher accountability. This blog is a Standing Indictment. And it is unbiblical not to explain, confess and repent. My feet were held to the fire. Extraordinary measures (sin) were taken to maintain this thief-dom of corruption against victims. It is time that these questions are answered. And if the questions can’t be answered honestly, than the question of Biblical Qualifications for the people involved are answered. You have helped to answer “that question” for them. Jones, Andrews, Conti and yes Linda Schreck have avoided all accountability. It is an accountability that is required by scripture. It is an accountability which is much higher than mine or my family according to that same Holy Scripture. It is and was their “reasonable service”. It is nothing less than moral turpitude. And people who know me know that I don’t use those terms lightly. And John, there is no lack of documentation. It is not “he said they said” documentation. It is obscene to hold the sheep to a higher standard than leadership. John, I would like you ask yourself a question, What if some miracle I appear at the church because some act of repentance takes place; how are you going to greet me and face me brother? Because you wrote your “Hit and Run” piece with it in the back of your mind that you will never see me there. There is something I need an answer on and I need it from your boss, Pastor Edward A. Jones, not you John. It appears you used your Faith Assembly of God email account when you sent this during working hours while you were paid by our tithes and offerings to do so being a hireling. That means your boss has some complicity in your actions whether you intended it or not. As stated you have a history of representing Faith Assembly of God publically outside and within the walls of the church with leadership blessings. John, in your submittal you sought to bear false witness against me and inadvertently did the same against others who you said was petty in their concerns. You did indeed commit slander. You did this with the intention of going public. The tactics you used were not the tactics one would associate with being a Christian in your submittal, let alone should represent someone in full time ministry and someone who Pastor Edward Jones has raised to be a leader. And by the way John, your position alone demands you stay clear. Public sin for those in leadership in public ministry requires public and private confession. You have sinned against more than a Brother in Christ. You have sinned against the people harmed. You have sinned against Yeshua. So I suggest you give a copy of this to Pastor Jones as well as a copy of your submittal. Please remind that all communications will be by email. Remind him that not to call me, especially at my employment as others have done. Any other communications can be worked out between him and me via email. I specifically want to know if you are representing Ed Jones and what he proposes to do about your slander and behavior. Pastor Jones has to answer that question. I am not going to deal with an underling again. He is accountable for what you wrote. I hope you get past your defensive mode and you will read this and find the Holy Spirit convicting you of what I wrote. Eventually what I wrote may edify you. Please take to heart my high recommendation that you stay off the platform until you repent. And please refrain from ministering to the brethren until you learn doctrine and compassion. The evidence here says it isn’t your gift. John you are more concerned with appearances and what it takes to maintain them, then the victims who are thrown under the bus. Again sir, that is idolatry. Again, leaders are to be held to a higher standard. There is no protected class in Christianity that gets special dispensation for sin. That is called a cult. It is just the opposite. Don’t try to silence the victims; it is an act of Satan. The people the Bible says to silence in the church are the False Leaders, False Prophets and the False Teachers. The voices of the wounded sheep is not bringing dishonor on the church. It is the sinful acts of leaders that bring dishonor and division in the church. The silence just allows sin to grow. Your sin of “Respecter of Persons” has led you to your sin of a public Bearing False Witness against a Brother. You have to admit this whole thing is a great study on how “sins” grow and are heaped up one on top of the other until “Jesus” is just a passing thought. That is the story of the American (Western) Evangelical Church as told to us would happen in the last days by the Holy Scripture. John, I know I am the wretched of the wretched. Repent brother and live out a Penitent Faith in Christ. “A Brief Conclusion and Commentary of this two part series”. As stated in the Administrative section, a email was sent to Pastor Edward A. Jones to answer for John Morabito’s statement. If you have been wondering if Edward Jones has replied you are wrong. Only a few of the people affected actually asked if he replied. No one really expected he would. And that email was only written so that Brother Ed could not say he was not given a chance (again) to make a difference. “Brother Jones, As this was done on “work” time with the church email address. Did the church sanction this submittal? Regardless whether you appointed him for that attack; what are you going to do about this? Pastor Edward Jones’ non-answer leads to a lot of questions. It surely doesn’t help John Morabito’s case. It sure leads to questions on ministry intergrity. It goes to the heart of the matter that EJ will avoid responsibility at all costs. It goes to his stand of don’t make waves, protect his inner circle (his buffer) at all costs. To include the “hell” with his pastoral mandate in the Holy Scripture and subsequently circumvented our by-Laws and Constitution. Never mind the big price the targets have taken of Pastor Jones. Just think of it. If John was indeed righteous in what he did and wrote (And that is a very very BIG “if”), then John Morabito has been left out to dry because his friend EJ wouldn’t step forward to lessen the response or defend John. And to be fair, the people John “used” as an excuse to defame me using a narcissist favored technique known as “Blame Shifting”, never came forward to either support the content of John’s Letter nor separated themselves from such argumentation. “Pastor” Schreck didn’t, “Deacon” Andrews didn’t, “Deacon” Conti didn’t, former “Deacon” Martone didn’t, Ogden didn’t, and Bieneman didn’t. Nor did the Cocurullo/Dixon Team. None, Nada, zip. But that doesn’t excuse Pastor Edward Jones’ complicity in the matter. Pastor Jones part in it grows every day he “does nothing”. Does anyone read the Pastoral/Overseer Epistles? As stated, this series of posts is an Standing Indictment. It is also a Biblical study on what happens when ”Cheap Grace” creeps into a Church in the form of Heretical Movements that make the Judaizers and the Gnostics of the New Testament time look orthodox in their theology and doctrine. It has led to this sin to be heaped upon with more sin. There is no question I ask that a Bible believing church should not address. Not one. And if leadership cannot humble themselves and repent, then they have no moral authority to teach the sheep to do so. There is no Biblical Authority without adhering to Biblical Doctrine. We live in an era of “Hyper Cheap Grace”. We live in it because the Visible Church refused to address the prophetic voice of people like Bonhoeffer. Every Age in Christianity brings heretical movements, which are not addressed leads to the next generation to handle a bigger and growing heresy. And that Brothers and Sisters is the cycle of 2000 years of Church History. It is also the case for ancient Israel which mirrors the cycle of Heresy in our Age. This is the state that the western evangelical visible church is in today. We live in an age of “Hyper Cheap Grace” for which Faith Assembly of God is just another story that represents that age. We love men’s dreams over the “Word of God”. We have become idolaters worshiping “church” Leaders instead of the Crucified Christ who tells us to repent for the forgiveness of sins and to live for His truth. Remember, I was told as a cripple to deceive/lie to my family and my employer for the sake of protecting two unrepentant criminals by both Pastor Linda Schreck and Deacon George Andrews. Both are leaders in our church. That should be enough to send shivers down a Christian’s spine. But it doesn’t phase the likes of John Morabito who is our representative leader. Why? That in itself tells more than I can type on this blog. John Morabito as Pastor Edward A. Jone’s representative couldn’t dent the veracity of this Standing Indictment. John only confirmed what was written already and we thank him for that and thank Yeshua for the opportunity to clarify and restate what needed to be talked about. As you see we have a lot of questions to be addressed. A lot more questions have arisen just in this series responding to John Morabito, a leader of Faith Assembly of God of Poughkeepsie, NY. There is no moral or ethical reason for a righteous Christian leader not to answer them. And there is EVERY righteous reason for those in leadership to address them. There is no Biblical reason not to answer this Standing Indictment. Or else we would have seen it by now. It was the Truth that led me to collapse at the foot of the Cross. Hopefully it was the Truth that sent us to the cross for all of us who declare Jesus as Lord. Where is that yearning for that Truth today? There is a couple common threads that go through this series of our common thread that I should have amplified for which I never really focused on but should have. And that is the destruction and/or attack of ”the Priesthood of ALL Believers”. This thread that is common throughout this series overlaps or is entwined with what Bonhoeffer talked about when he warned about “Cheap Grace”. But another common thread that I should have amplified for which I never really focused on but should have. And that is the destruction and/or attack of ”the Priesthood of ALL Believers”. This thread that is common throughout this series overlaps or is entwined with what Bonhoeffer talked about when he warned about “Cheap Grace”. If there is a common thread that goes this series on both Part One and Two is a universal attack on the Priesthood of All Believers. A person who has contempt for that doctrine is by definition cannot be in any leadership within the church. Because if they don’t believe in it, they have contempt for that which is central office of their very own position of “overseer”. They cannot confess Jesus and have contempt for God’s priesthood. If a leader shows contempt for “that” ministry of the priesthood of all believers that God has given you; that leader is not qualified as an overseer. If he or she is consistent in showing contempt and/or lives a impenitent (in contrast to a Penitent Faith in Christ) life, then it is clear that that person isn’t in the Priesthood of All Believers and just may never have had those qualifications of an overseer. How many of your Brothers and Sisters have been unbiblically exiled from Faith Assembly of God? Were there not rumors and slander propagated by leadership leaks? Does that qualify as an attack on that Priesthood of ALL Believers? You can’t find a section of this series where example after example where the Priesthood of All Believers has not been attacked. A Leader who attacks victims from within the church for defending their family does not believe in the Doctrine of The Priesthood of All Believers. A Leader that engages or enables release of privileged personal information or does nothing to mediate and be a vessel of repentance to the victims of such behavior does not believe in the Doctrine of the Priesthood of All Believers. A Leader who twists Biblical concepts like forgiveness without repentance, that sin is really mistakes (like extortion?) , expediency over righteousness, that leaders are an authority to themselves (Self as God), overlooking and participating in both moral and doctrinal heretical behavior to avoid conflict, etc .. does not believe in the Doctrine of The Priesthood of All Believers. When a leader creates an inner circle to act as a buffer zone to prevent inquiry and accountability does not believe in Doctrine of The Priesthood of All Believers. When a leader uses an “underling/hireling” to uses tactics as John Morabito has done for Pastor Edward Jones to create a buffer for accountability avoidance does not believe in the Doctrine of The Priesthood of All Believers. When a leader formalizes the exiling of a sheep without explanation against Holy Scripture and their own stated By Laws to avoid confrontation of personal and pharisaical sin of his or his inner circle does not believe in the Doctrine of The Priesthood of All Believers. If a Pastor is willing to silence a cripple from preventing him from getting help for him and his family in order to protect to impenitent criminals in the congregation, that made it nessesary for that cripple to get help outside the congregation and outside the geographical area; then that (those) Pastor(s) doesn’t hold the Biblical qualifications of a “Overseer”. If that same said Paster summarily exiles that crippled sheep from the flock without regard to Holy Scripture and that church’s stated By-Laws without even telling that cripple a valid reason. means that Pastor probably NEVER had the qualifications of “Overseer”; an act that was meant to cover up his or hers own Pharisaical and Personal Sins. I would love to hear a rational Biblical explanation. And just a note: The Bible also mentions a overseer does not have the qualifications when he acts for sordid gain,. This is not just money, it is maintaining a title, and act to continue to live in un-repentance. And this is where “Cheap Grace” meets “contempt for the Doctrine of the Priesthood of ALL believers”. Pastor Jones is the Chief Purveyor of Cheap Grace at Faith Assembly of God. By his acts he has shown he does not believe repentance, forgiveness, reconciliation or restoration as mandated by Orthodox Doctrine. Thus EJ has demonstrated he does not believe in the power of the Holy Spirit he preaches on as much as this crippled sheep EJ exiled. The office of the Priesthood of ALL Believers is not to be trifled with by anyone. It is an office we sheep must show worthiness and maintain by living out a Penitent Faith in Jesus the Christ. It should be defended. We sheep have that responsibility. Let me repeat what Jacob Prasch of Moriel Ministries has stated is the two Biblical points of action when that Priesthood is assaulted if you see this happen in your fellowship: You are to stand up and leave or you are to stand up and fight. That is your responsibility Yahweh gives to you. Staying seated on you blessed assurance is not an option in the Bible. It is allowing the wolves to take from you what God gave you. The office of the Priesthood of ALL Believers; It is the most worthy office for one to fight for in our faith. I realize this is a real long post. If you read the two posts, I want to thank you. It covers a lot. It needed to be said. I am humbled whether you agree or not. There is no way I can summarize what was written. If there is one center point or core section I would like to emphasize, it would be the section labeled “John Ms Attack Point 3 – The forgiveness Card and Cheap Grace” in Part One of Our Response to a Faith Assembly of God Leader in Poughkeepsie: John Morabito. I wish I wrote more on Bonhoeffer and Cheap Grace.. The understanding of salvation in Jesus Christ is center in our lives, not what God can do for us in the temporal. If you begin to understand that, truth will not be a ever devalued commodity in your life. This series has several sections and different parts are written to different targets. If there are universal target groups that I am writing to, it is those who have been abused by unscrupulous leaders. I am writing to brothers and sisters in the faith that see what is going on and need the big picture and for encouragement and strength in their walk. You are not alone. You are not going crazy. It isn’t Biblical Christianity. Yeshua (Jesus) isn’t the problem, it is the Pharisees (wolves) and Hirelings. And Jesus warned us about them 13 times in the Gospels. I am writing to leaders who have taken the wrong road and hearts have not hardened who need to repent for the forgiveness of sins by a merciful God. There are people I have mentioned here with the hope that John Morabito will study. They are from current apologists that take on heretical behavior inside the church and to the people who do their work in Spiritual Abuse; these folk are great resources for understanding what you are going through to the ones here that center on giving you a great base for defending the Faith. It is discernment through study of Orthodox doctrine and theology that has helped me the most besides a relationship with Yeshua. And if you see people going through the same thing, it is my prayer you come along side that battered sheep. If you haven’t noticed yet, there is a great link between Spiritual Abuse and the modern day Heretical Movements within the church. Use these resources. Study yourself to show yourself approved. Not for men, but for your relationship with Yahweh, the God of all. This is the area of apologetics today that is being hidden from the sheep by the false teacher, but is most needed. I don’t get that just from a Biblical scholar; I read it in my Bible, and It is the words of Yeshua who tells us that False Leaders is the greatest sign of the end of the age. That is the Olivet Discourse in Matthew 24. And the Olivet Discourse is preceded by the 7 woes. The seven woes Matthew is Jesus communicating to the sheep about how Yahweh feels about Pharisaical Sin and the purveyors of such. (Note: some also call it the 8 woes). Let me wrap this up now. There is no clean way to do it. He knows what you are going through. He has not forgotten you. He will not forsake you. You are in him and He is in you. He loves you. Fight the Good Fight of Faith. God Bless you.